Travel from the capital city to destinations around Thailand on a relaxing Bangkok train journey. Railway lines from the city head off in all directions to the south, north, east and west. As well as to the borders with Laos, Cambodia and into Malaysia. If you are travelling around Thailand, the train may not always be the fastest way to get from a to b, but it is often a great experience (compared to travelling by bus or minivan). 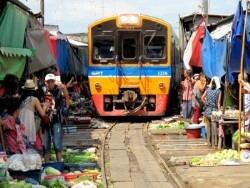 Take a day trip from the capital to the famous Train Market at Maeklong. Take a tour or do it yourself by local train. Heading south from Bangkok, the town of Phetchaburi offers visitors many historical sites to visits with two former Royal Palaces and the famous Tham Khao Luang caves just outside of town. Ban Cha-Am is the first real beach resort in Southern Thailand you come to on the southern railway line and is a very popular escape for the Bangkokian's at the weekends and offers a real Thai resort feel with long sandy beaches stretching all the way down to Hua Hin. Just 25 kms south of Cha-Am you come to the much larger beach resort of Hua Hin. If you like city style living with some pleasant beaches this place could be for you. If you want a more peaceful laid back resort keep heading south. Pranburi town does not have much to keep you hanging around, but a short drive outside of town there are some lovely peaceful beach resorts at Pak Nam Pran and Dolphin Bay and into the National Park of Sam Roi Yod. The town of Prachuap Khiri Khan is famous for its great food and is a great place to stop for a day or two, with some lovely beaches just outside of town. Ban Krut has a couple of lovely long sandy beaches, split by a beautiful hilltop temple and is a great place to escape the crowds of the larger beach resorts to the north. Bang Saphan Yai is another good alternative beach escape with some nice beaches 5 kms outside of town. Most people come to Chumphon to travel from Bangkok to Ko Tao island and its famous scuba diving, but if you have time to explore there are some pleasant beaches to the north of town. Surat Thani railway station is a major travel hub for people travelling out to the islands of Koh Samui and Koh Phangan or to connect with buses to Krabi and Phuket on the west coast of Thailand. Heading south the main Southern line branches off at Thung Song Junction and travels South-West to the city of Trang from where you can visit the many beaches and islands off the coast nearby. Thailand's southern city, Hat Yai is the gateway into Malaysia, with daily trains to Butterworth Penang and Kuala Lumpur. Although there is no railway lines in this area of Southern Thailand, you can catch a train to Surat Thani station and then connect with buses that depart from outside the station over to the west coast. The one direct train service leaving Bangkok daily to Butterworth station (which is located next to the ferry over to Penang Island) now terminates at the border station of Padang Besar. To get to Langkawi from Bangkok, you can go by train via Hat Yai, Arau or Alor Setar. To get to KL by train from Bangkok you first have to go to either Hat Yai or Padang Besar. From Hat Yai there is a Shuttle train to the border, where you can connect with the new fast Electric Train Services (ETS) to KL. From Pdg. Besar there are many ETS services a day to KL. Trains to the border of the North East of Malaysia for Kota Bharu and the Perhentian Islands travel through the troubled provinces of Yala, Pattani and Narathiwat. One of the most popular train trips is to Thailand's Northern city of Chiang Mai, with a number of services a day travelling mostly overnight. There are plenty of services for the relatively short journey out to Don Muang, where you can just walk over a foot bridge to get to the airport. The old capital of Thailand can be reached by train with dozens of departures a day and makes a nice day trip from Bangkok. An easy way to travel from the city to this popular national park is to take the train from Hua Lamphong to Pak Chong (the northern gateway to the NP). The end of this branch of the North-Eastern line takes you to the Mekong River and the Thai / Laos border crossing over the Friendship Bridge. Travel by train to one of Isaan's major cities located in North-East Thailand. You can now travel into Laos from Thailand by train. The train doesn't quite reach Vientiane yet, but if and when the high-speed rail project gets built, these two capital cities will be connected by a direct rail service. Trains to Ubon Ratchathani > - for the border crossing to Pakse in Southern Laos. The Thai / Cambodian border crossing at Poipet is due to be linked up by the Cambodian Railways network which is currently being rebuilt. For now you will have to catch the train from Bangkok to Aranyaprathet which is around 5 km away from the border. Trains to Kanchanaburi from Bangkok, leave from Thonburi Railway Station and cost a set, 100 Baht for a 3rd class ticket on these "Ordinary Train Services". Once your flight arrives in Thailand, your first train journey can begin from BKK Airport, with new modern and fast trains linking the Airport to the centre of the city. 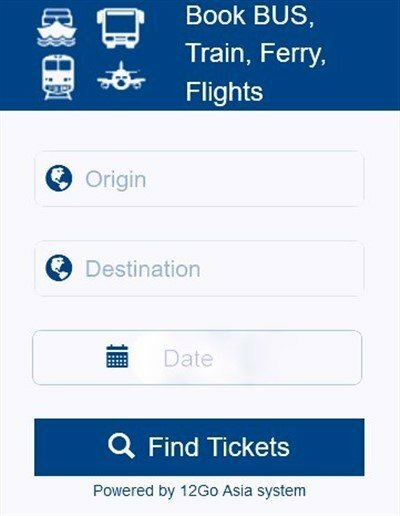 This is the fastest and the cheapest way to get down-town! Most departures from Bangkok are from Hua Lamphong Railway Station, with a few others to the south and east to Kanchanaburi, leaving from Thon Buri Railway Station. You can however also use Sam Sen station or Bang Sue station which is a major junction connected by the Northern, North-Eastern and Southern Lines. Wongwian Yai Station has services to to Samut Sakhon.